Our meetings in the coming season will be on the 2nd and 4th Wednesdays of each month in the Midleton Resource Cente, Old Youghal Road, Midleton (P25WP38) at 8pm. Do you fear the idea of speaking in a group setting? Do you want to express yourself more clearly? Would you like to build up more confidence in your communication skills? Or, maybe you just like talking and would like a forum to get your views out in the open! If so, then Toastmasters may be just for you. Toastmasters is one of the most effective ways to develop confidence in public speaking and general communications. Since 1924, Toastmasters International has helped millions of men and women become more confident in front of an audience. It's a member based learn-by-doing approach, and because everyone is involved, it's a lot of fun! Toastmasters is open to all adults, young and old. You are very welcome to come and see what its all about, by attending one of our upcoming meetings, and don't worry - we won't ask you to speak if you don't want to! Toastmasters have been in Midleton since 1995. We meet in the Midleton Resource centre 2nd and 4th Wednesday of each month. It is an open, friendly, fun-loving club that doesn't take itself too seriously. We have members from all around the East Cork area. The club has a good mix of new and experienced members: men and women, young and old from all walks of life. New members are very welcome. Meetings normally consist of three parts: prepared speeches, topics and evaluations. Members learn by delivering speeches, giving impromptu talks and participating in the various different roles at each meeting. No meeting is ever the same, and are completed by 10pm. We also have a poetry night, themed meetings (eg Halloween ) and competitions during the year. 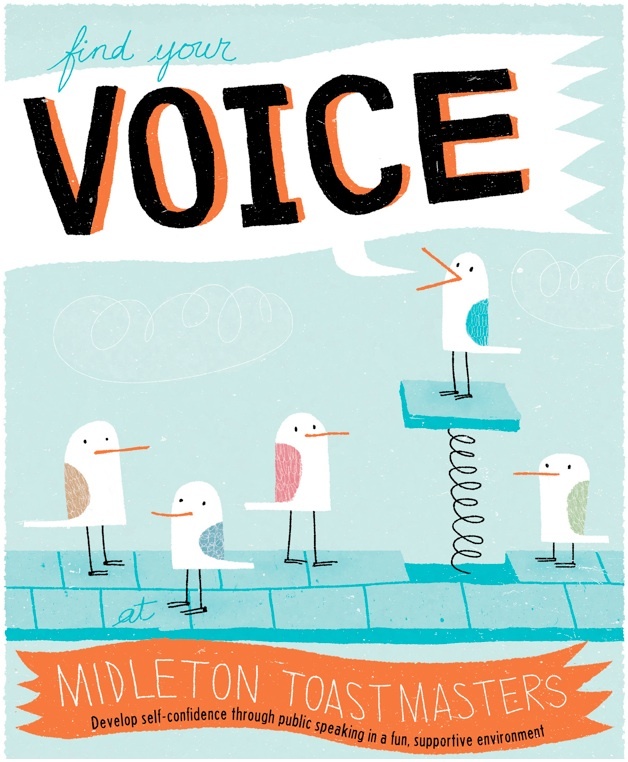 If you want to express yourself in a small, supportive club, Midleton Toastmasters is for you.